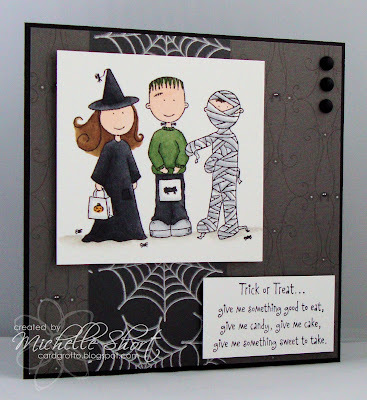 Today is release day for the new Elzybells stamps - woohoo! Although I have loved working with all the new stamps (of course!) the most fun I had was making these Halloween samples. There is a great Mini Messages clear set and lots of cute individual stamps too. 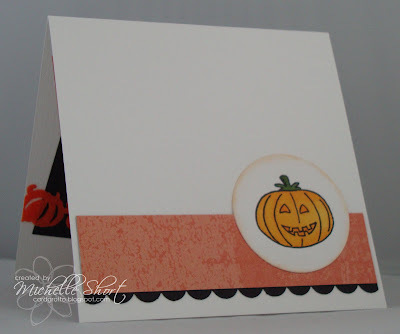 First up is a cute card using the Pumpkin Girl stamp and also the Seasonal Sentiments clear set. 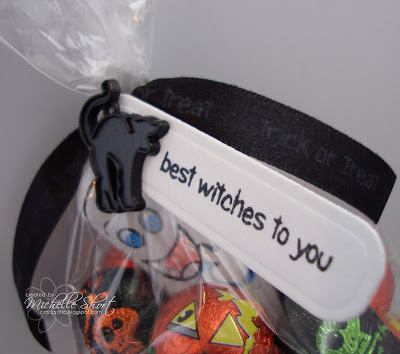 The inside also uses the Mini Messages - Happy Haunting set. STAMPS: Elzybells Art Stamps. INK: Memento Tuxedo Black. CS: Craftwork Cards, Doodlebug Designs, Little Yellow Bicycle. 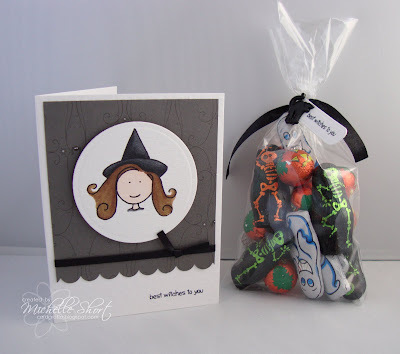 ACCESSORIES: Queen & Co pumpkin ribbon , Stampin' Up Scallop Border Punch, Pebbles Inc Card Dots, Copic Markers. STAMPS: Elzybells Art Stamps. INK: Memento Tuxedo Black. CS: Anitas, Craftwork Cards, Heidi Grace. ACCESSORIES: Pebbles Inc Candy Dots, Copic Markers. Lastly I have made some cute treat bags with cards to match. One for the girls using the Mini Messages - Happy Haunting set. STAMPS: Elzybells Art Stamps. INK: Memento Tuxedo Black, Elzybells inky-dinks Whipped Cream Hybrid Ink. CS: Craftwork Cards, Heidi Grace. ACCESSORIES: Stampin' Up! Scallop Border Punch, ribbon from stash, Nestabilities dies, Little Yellow Bicycle Frightful Collection charm, Copic Markers. 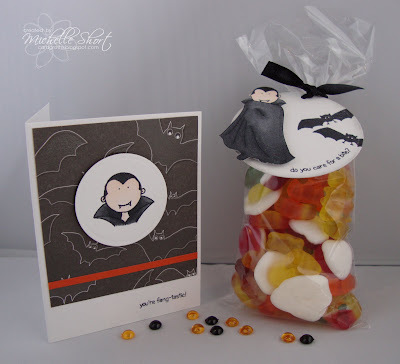 One for the boys using the Mini Messages - Happy Haunting set and the Dracula individual stamp. 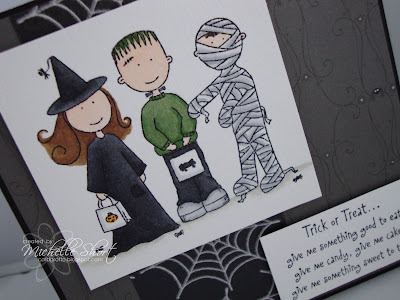 Quite difficult to see in the photos but on both I have stamped the black ribbon with the trick or treat stamp from the Seasonal Sentiments set using Elzybells inky-dinks Whipped Cream Hybrid Ink. STAMPS: Elzybells Art Stamps. INK: Memento Tuxedo Black. Elzybells inky-dinks Whipped Cream Hybrid Ink. 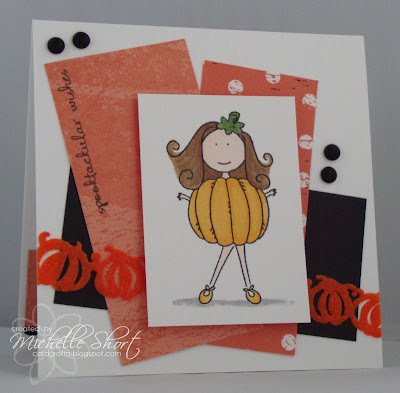 CS: Craftwork Cards, Bazzill Basics, Cloud 9. ACCESSORIES: Nestabilities dies, ribbon from stash, Copic Markers. I hope you have enjoyed looking at my elzybells sneak peeks now go buy, buy buy!! I love them all, can't choose a favourite between them! Brilliant colouring of all the images and I love the treat bags. 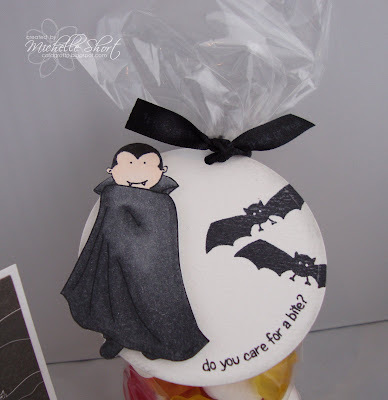 Is that DP behind the dracula card, or have you stamped the bats on there? CUTE!!!! Love them all...I Luff halloween and you can't get much better than an Elzy Halloween! Grandiosos!!! todas tus tarjetas están bellisimas!!! no se si sabrás español pero ojaká y si mis más sinceras felicitaciones!!! Congratulations!! !